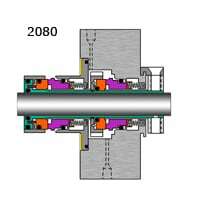 The FSI 2080 is a dual cartridge pusher seal with flexible stator design. Dual seals are double balanced to provide both pressurized and non-pressurized seal options. Sizes: Up to 5.00” Available in both inch and metric sizes.